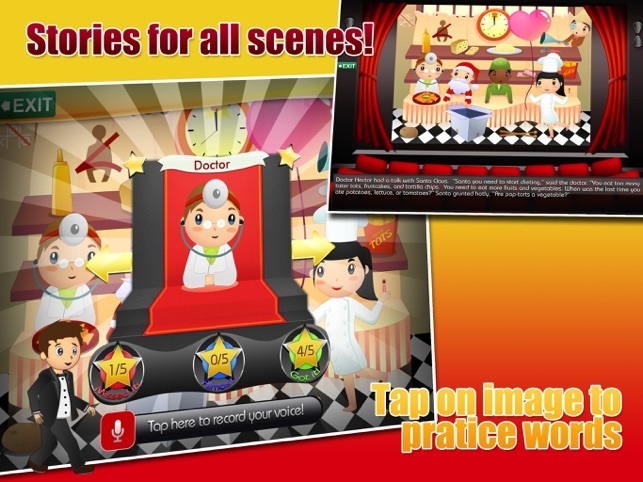 Articulation Scenes brings articulation practice to a whole new level! 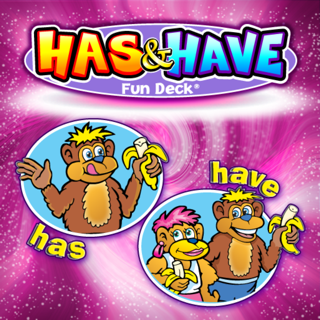 This app, developed and designed by a certified speech language pathologist allows children to practice their sounds with a variety of engaging and fun activities centered around the cinema theme. 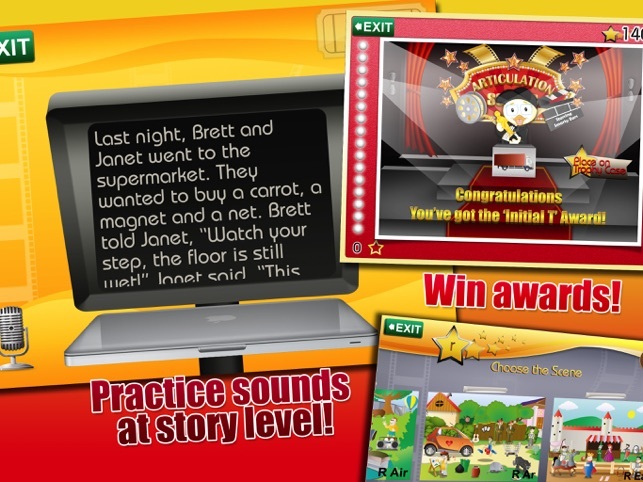 Based on scenes, Articulation Scenes provides numerous opportunities for children to pronounce their sounds more clearly. All activities were beautifully designed around the theme of cinema and movies for a fun and interesting learning activity. 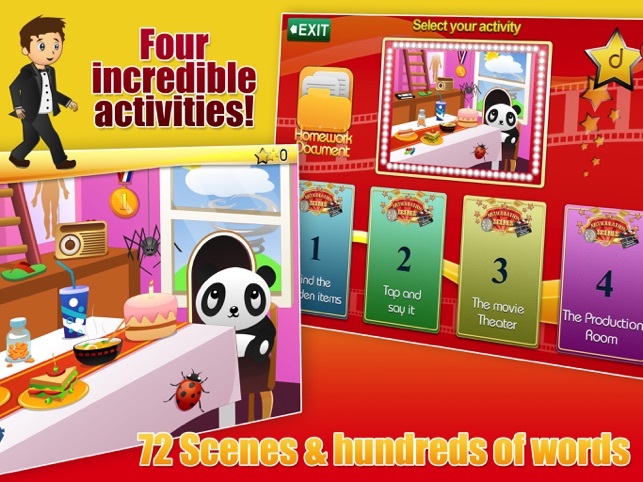 1.Find the hidden items: Allows children the opportunities to listen to targeted words and find them on each scene. 2.Tap and say it: Children tap on the items on the scene, which are isolated allowing the therapist to track and monitor their productions. 3.The movie theater: Children get the opportunity to listen to a story using the target words. 4.The production room: This is the activity that allows children to either create their own stories, record them and continue to practice. We have included one scene per sound per position. Additionally, for children who need practice with one of the most targeted phonemes in speech therapy sessions / r/ , we have included one scene per each separate type of the sound “r” : [ pre-vocalic, blends, air, ar, ear, ire, or, rl ]. 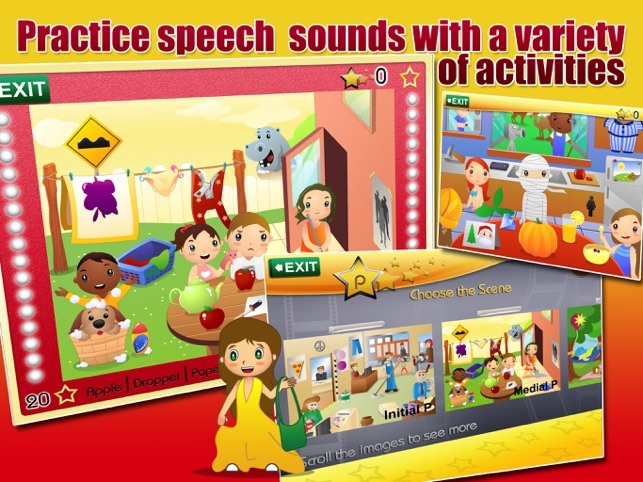 Articulation Scenes offers children the opportunity to learn to pronounce their sounds from pre-recorded audio built-in on each activity as well as the ability to record their own voice pronouncing the words. Data tracking capabilities and exciting reward activities are also some of the great features on Articulation Scenes. We have completed the application by adding homework sheets containing the words included on each scene that can be sent home for further practice. My kids love this app and it's great for articulation carry over. I also like using it for kids working on language skills like descriptive words and sentence construction. I use it at least once per day. Great app! The variety of sounds and levels it has allows me to work with groups. It keeps my students highly engaged. I noticed they are missing a scene for “er”. I would love to see that added.